This Product is DIGITAL only. The Print copy is sold out. Mythic epics are the driving force behind fantasy role playing games, and Castles & Crusades is no exception. For the first time, C&C branches out into the ether and brings you Of Gods & Monsters, a book we guarantee you'll want and use. Written by James M. Ward, this book stands alongside Monsters & Treasure as a tremendous resource for adventure and fun. James M. Ward returns to a subject he knows very well, delivering a plethora of information on hosts of gods, godlings, heroes and the magic that drives them. In Of Gods & Monsters, Mr. Ward explores over 16 pantheons including Norse, Greek, Roman, American Indian, Aihrdian, Inzaen, demi-human pantheons and more. Beyond a simple recitation of deities, Of Gods & Monsters presents playable incarnations of the gods in the guise of their own avatars. The deft and experienced hand of Mr. Ward explores spells, magic items, rituals and more. Castle Keepers need not struggle with characters encountering all powerful deities, but rather they can use the avatars to spice up and drive adventures of the mythic and the divine. These avatars are designed to be playable version of the gods, but not the gods themselves. Complimented with mythic monsters and holy items, Of Gods & Monsters is a must have for any serious CK. But it's not for the CK alone. Players find loads of information from hosts of new cleric and Druid spells to rituals of the divine. 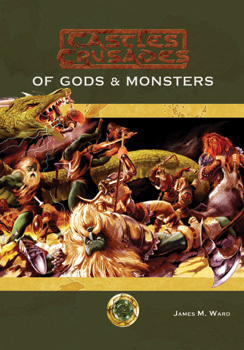 Clerics, Druids, Paladins, Bards and all the characters will benefit from Of Gods & Monsters. Graced with a beautiful painting by Peter "20 Dollar" Bradley, lined with hordes of pictures of the gods themselves, Of Gods & Monsters is a perfect complement to the ever growing C&C game system. Players and Castle Keepers will find a store of useful game material in this book.